Animal Hot Springs is a relaxing idle clicker game from Superthumb. It lets you manage a spa exclusively built for cute creatures. You will have to install various facilities, such as showers, and fulfill demands of animals lazing in the big bathtub. In return they will pay acorns for your services. You can send the manager cat every now and then to invite more creatures to your hot springs. You can also unlock the sauna to provide more services to your esteemed guests. Animal Hot Springs can be challenging once lots of animals throng the spa. You will have to provide the right bath items to them, build bigger, better facilities and serve good food to keep them happy. Acquiring acorns won’t be easy if you don’t know how to manage the spa. Check out these tips, hints and tricks if you want to get lots of bonus acorns, build more facilities and unlock the sauna. Animals will demand certain items from time to time. An item’s icon will be displayed above an animal, all you have to do is drag that item from the bottom of the screen to the animal. When you meet animal demands, you not only increase your reputation, but also contribute towards upgrading their VIP status. Raising reputation will let you invite more animals. Some of them will offer more acorns than others. When an animal attains VIP status, it gives bonus acorns. You will have to provide 10 bath items to an animal to upgrade it to VIP status. An animal reaches a new VIP status when you provide 10 bath goods to it. Always purchase all bath items in advance so that you can offer them to animals whenever they demand them. Since the demands are totally random, it’s better to stock up on all items. The bath item icon above an animal appears for a few seconds. You will have to drag that item towards the animal before it disappears. Check the number below an item on the bottom of the screen. When it’s 0, quickly tap the menu > bath goods and stock up on that item. In the beginning, it will be difficult for you to buy all bath items since you will earn fewer acorns. We recommend building a shower immediately when you accumulate 10 acorns from animals. This will unlock “facility rewards” and you will get bonus acorns. To get facility rewards, tap acorns next to the manager cat in the lounge. Make sure you build all cheap facilities to get bonus acorns from the lounge. You can also get free items from the “lucky box”. Tap menu > bath goods and scroll to the bottom to get your lucky box. You just have to watch an ad to get a random item(s) from the box. You might get lots of items from that box. I received 23 bath towels from the box. Animals offer acorns every few seconds. Tap an animal when an acorn appears above it. However, you can “force” an animal to shell out acorns by tapping it repeatedly. Make sure the animal isn’t demanding an item, else this trick won’t work. Tap an animal when idle to get acorns faster. If you have just started playing Animal Hot Springs, then the first thing you should do is install a new facility as soon as you accumulate 60-70 acorns. Building a new facility unlocks facility rewards. Start by installing “shower 1”. It costs only 10 acorns. Tap Menu > Facilities and then click on the facility which you want to install on the bath tub room. 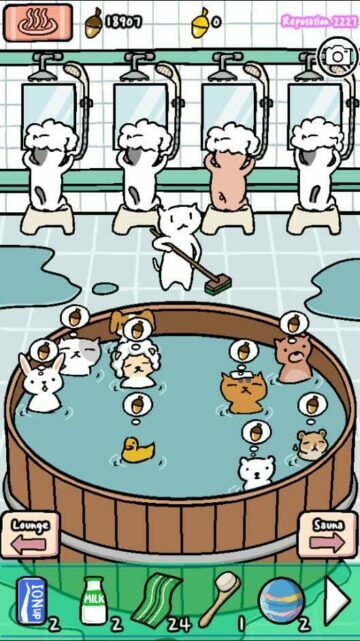 You can then install shower 2 and then hire the cleaner cat once you collect 50 acorns again. Now go to Lounge and check your facility rewards on the left side of the screen, beside the manager cat. You will notice that the lounge room earns acorns automatically. Just tap to collect acorns. Bonus acorns increase by 1 whenever you add a new facility to the bath tub room. Keep installing facilities to get lots of acorns as facility rewards. As you fulfill animal demands in the bath tub, you increase reputation. With more reputation, you also get to invite more animals. You will have to reach a certain reputation to unlock animal slots. You can view “reputation requirement” when you go to menu > collection book. To invite a new animal, go to Lounge and then tap the manager cat. You will have to send him to bring a new animal. It will take an hour to invite a new animal, but you can speed up the process by tapping the bell to watch a video. Every time you invite a new animal, you also increase the chances of getting more acorns. Some animals provide lots of acorns than others. For example, a level 1 Yelly (duck) gives 17 acorns than a level 1 Buddy or Zizi or Nyaon. You can check the number of acorns each animal grants in the “collection book”. Once you invite 10 animals, you should change your current “wooden” bath. It can hold only 10 animals. You will have to buy a new bath that can hold at least 20. As you keep inviting more and more animals, you will need bigger baths, so make sure you stock up on acorns to buy newer baths. You will get lots of reputation when you purchase a bath. As soon as you build a new shower, guests will begin using it. When they leave, they will pay acorns. The more showers you build, the more bonus acorns you will get from each guest. You can install a maximum on 4 showers in the bath tub room. In Animal Hot Springs, golden acorns are rare to acquire. You can use them to purchase backgrounds. To get golden acorns, you will first have to open the “Sauna”. To do this, collect 300K acorns and reach level 20. To reach level 20, complete achievements. I think this is where most players get confused – leveling up. You reach a new level when you finish an achievement. To know your achievements, tap menu on the upper left corner of the screen and then tap “Achievement”. Check what’s your current task and complete it to level up. Once you reach level 20 and accumulate 300000 acorns, you are ready to unlock the sauna. You will have to make food on the sauna and serve them to animals to get a chance of acquiring golden acorns from them. How do you replace food in sauna? You will have to drag and drop raw food into the brazier and tap the brazier repeatedly to keep it hot. When ready, drag the roasted food back into the empty space on the bottom of the screen. Feed the roasted food to animals when they demand. When you drag the roasted food back into the empty space, you free up space to add more raw food on the brazier.